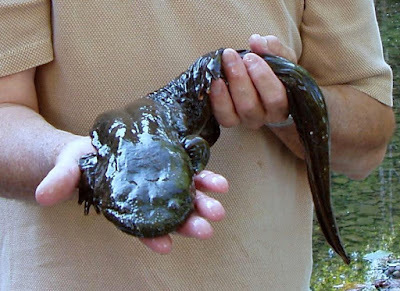 On February 6, the House State Government Committee voted 24 to 1 to approve and report out Senate Bill 9 (Yaw-R-Lycoming) designating the Eastern Hellbender as the state amphibian and clean water ambassador (sponsor summary). Rep. Brett Miller (R-Lancaster) voted against the bill in Committee. Rep. Garth Everett (R-Lycoming), Majority Chair of the House State Government Committee, enthusiastically praised the students supporting the bill and passed out “Hellbender Defender” pins, temporary tattoos, and noted t-shirts were also available. The bill now goes to the full House for action when it returns to voting session on February 19. Hellbenders are North America’s largest salamander and survive where there is cold, clear, swift-running water. Growing to over two feet in length and weighing more than four pounds, they breathe oxygen from the water through their skin. A lack of streamside trees along Commonwealth waterways allows waters to warm, polluted runoff to enter rivers and streams, and silt to build up in streambeds. As a result, habitat for hellbenders has been degraded and hellbender numbers have been decimated in Pennsylvania streams where they were plentiful as recently as 1990. The bill just passed the Senate last Monday by a vote of 48 to 1. Sen. Scott Hutchinson (R-Venango) voted against the bill. Sen. Gene Yaw, prime sponsor of the bill and Majority Chair of the Senate Environmental Resources and Energy Committee, attended the State Government Committee urging action on the bill. “Even in times of budget crisis and pensions and everything else impacting Pennsylvania, this is something that showed the student sponsors of the bill that their elected officials do, indeed, listen to them. They had a great idea and I was privileged to present their idea to the Senate on their behalf,” Sen. Yaw added.